2018 Dodge Durango Pros and Cons: Why (Not) This Car? A certain sort of car enthusiast delights in taking a vehicle not usually associated with driving excitement and stuffing it full of motor. You'll have to go aftermarket to get a Hayabusa-powered smart fortwo or a Hemi-powered Jeep Wrangler. But occasionally the factory obliges, as with the Mercedes-AMG G65. You might think it makes no sense to equip a vehicle designed in the 1970s for off-road military use with a 621-horsepower V12. But for others the utter ridiculousness of this combo is the charm. Dodge hasn't yet worked up the nerve to offer its largish three-row SUV with a 707-horsepower Hellcat engine, but for 2018 finally got around to offering the next best thing: an SRTized Durango with a 475-horsepower V8. Such a vehicle could have been offered six years ago, along with the then-new SRT version of the closely related Jeep Grand Cherokee. But one wasn't. Now that the Durango SRT is available, might it make sense as more than an object of whimsy? As a father of three, I've long wished for a vehicle that is both fun to drive and capable of easily carrying all of the offspring and their stuff. Does the Durango SRT deliver on both counts? Those seeking a performance-oriented three-row SUV have few options. The Mercedes-AMG GLS63, Range Rover Sport Supercharged, and Tesla Model X (which one of these is not at all likes the others...) are far more expensive than the Dodge. The Ford Explorer Sport is considerably less expensive, and much more directly competes with the Durango R/T, not the SRT. This leaves the Durango SRT in a class of its own. Does this look like the interior of a $75,000 vehicle? Why the 2018 Dodge Durango? Why buy a Dodge Durango SRT? Look to the front fenders for the most obvious reason: badges indicating that a 392-cubic-inch (6.4-liter) V8 engine resides under the hood. With 475 horsepower and 470 pound-feet of torque, this engine can press all aboard back into their seats and accelerate even a hefty, 5,500-pound SUV from a dead stop to 60 mph in five seconds. Credit the eight-speed automatic transmission (with ultra-quick shifts in sport and track modes), standard performance-tuned all-wheel-drive, and launch control with assists. The only significantly quicker gasoline-powered three-row SUV is the far more expensive 577-horsepower Mercedes-AMG GLS63. If you're interested in going electric, the Tesla Model X can be crazy quick, ludicrous even, but isn't as suited to sustained high-performance use. Even when its throttle isn't cracked wide open--or anything close to it--the Dodge's V8 titillatingly rumbles and roars. During high-rpm shifts it even barks. This aural drama helps the Durango SRT feel like something special even in casual daily driving. If you can actually exercise the engine, you'll have even more fun. But if you prefer your engines silent, this isn't the one for you. I've driven SUVs with powerful engines and clumsy handling before, and found that to be a dangerous combination. Among three-row family haulers, the latest Durango has since its 2011 launch been considered the driver's choice. Compared to a Chevrolet Tahoe or Ford Expedition, the Durango is about four inches narrower and feels much more agile. Compared to any three-row crossover with a transverse powertrain riding ahead of the front axle--such as the Explorer--the Durango feels considerably more balanced and more amenable to throttle-induced attitude adjustments. Plus it has more polish and poise than can usually be found in a mass-market sport utility. It's one of those vehicles whose handling simply feels right. To this basic goodness the SRT folks added mildly firmer suspension tuning (compared to the already firm R/T), more sophisticated multi-mode stability control, and an all-wheel-drive system that (when in track mode) can send up to 70 percent of the engine's torque to the rear. Thanks to the last, any inherent tendency to understeer can be readily counteracted with your right foot. However, even in SRT form the Durango's steering remains light, with little different apparent between modes. The Durango SRT I had for a week was fitted with the standard Pirelli Scorpion Verde all-season tires. Though wider than those on other Durangos, 295/45R20 vs. 265/50R20, these still surrender well before the rest of the chassis is ready to. A second Durango SRT I drove on the track at Road America was fitted with optional Pirelli P Zero three-season tires and consequently gripped curves far better. Add these tires to the strong engine, equally strong standard Brembo brakes, and intuitive handling, and the Durango SRT inspired confidence and performed commendably where few other large SUVs dare to go. As a package, this thing actually works. Dodge didn't just stuff a big engine in the regular Durango and call it a day, not even close. Among SUVs with truly usable third rows, only the Mercedes-AMG GLS63 can pull off the same feat. You can't even get a third row seat in the most performance-oriented BMW X5 or Range Rover Sport, and the third rows offered in lesser variants are of minimal utility. Teslas overheat and dial back power in sustained high-performance use. And the Ford Explorer Sport? Its chassis tuning is far more comfort- and safety-oriented. It provides little joy through curves on public roads, much less on a track. Just don't expect a Durango SRT to replace your sports car if you've really been doing sports car things with it. The Dodge handles well for its size and weight, but 5,500 pounds distributed along a 71-inch vertical axis cannot entirely be denied their physical due. The shape of the Durango's extended (for a third row) rear end is especially fluid. Logically located, easy-to-use controls. But looking a little plain and dated. Driving modes. Many largish crossovers can supposedly tow up to 5,000 lbs. When fitted with a $995 towing package, the Durango SRT, with a longitudinal powertrain and torque to spare, easily surpasses them with an 8,700-pound towing capacity. The Mercedes-AMG GLS63 comes up 1,200 pounds short. Even the Chevrolet Tahoe isn't rated to tow quite as much. But the new Ford Expedition is rated to tow another 600 pounds, so the Durango SRT isn't quite the champ unless you also want your tow vehicle to handle. The SRT tweaks to the Durango include sport front bucket seats. These seats, with their large bolsters, will hold you in place through curves. Those who actually take the Durango SRT to the track will find that the seat's headrest leaves sufficient space for a helmet. But not everyone will find these seats comfortable. For me, the lumbar bulge felt too large even when minimized. In back, the Durango offers among the most comfortable second and third rows you'll find in any family hauler. It helps--a lot--that both rows are mounted higher off the floor than those in the average crossover. Among SUVs, only the Ford Expedition offers a more comfortable third-row seat. One weakness: the Durango can't hold three people in the second row as well as girthier competitors, and can't hold three people in the third row at all. Of course, opt for the second-row captain's chairs (as most buyers likely will) and the second-row seating will be limited to two people anyway. Chrysler's infotainment interface arguably has been the most user-friendly in the industry. But it's showing its age. Newer systems often include more functions and look more sophisticated. I do like the number of number of performance parameters that can be adjusted and the array of performance stats that can be displayed and recorded through the "SRT Performance Pages." The former include the transmission, AWD system, suspension, and steering. The latter include acceleration times, braking times, and g-forces. Why Not the 2018 Dodge Durango? Like the Durango SRT's key strength, it doesn't require the skills of Sherlock Holmes to detect the Dodge's primary weakness: its fuel economy. In the EPA's tests, the Durango SRT managed only 13 mpg city and 19 mpg highway. The trip computer typically reported 12 mpg in my suburban driving. Driving the brute like a Prius bumped the number all the way to 15 mpg. On the highway I observed as high as 20 mpg, again in line with the EPA rating. The Durango R/T manages a bit better, 14/22, putting it not far off the Explorer Sport's 16/22. But a Mercedes-AMG GLS63, with turbochargers to pack more fuel-air mixture into its cylinders, can guzzle even more than the Durango SRT: 13/17. If you want an ultra-quick three-row vehicle with outstanding fuel economy, you're currently limited to the Tesla. Though perhaps the plug-in hybrid Volvo XC90 T8's 26/30 is good enough? The Durango might be a polished truck, but it's still a truck. Even in regular form the Dodge often rides bumpily and heavy-footed over the small stuff. The SRT's firmer suspension and larger, heavier tires amplify this weakness. The SRT's standard adaptive dampers let you choose between evils. In "track" mode the frequency of vertical motions increases but their amplitude is reduced. In any mode some people will find the Durango SRT's ride annoying. I haven't driven the Mercedes-AMG GLS63. But based on my test of a Mercedes GL350 with a non-sport suspension a few years ago, I don't expect the GLS63 to ride much better than the Durango SRT. A Ford Explorer Sport, while much less athletic than the Dodge or the Mercedes, does ride much more smoothly. Differs only in detail from the much less expensive Durango R/T. Second row comfortably high off the floor. As in other third-generation Durangos, wind and road noise are hushed. But the engine isn't. As mentioned earlier, this can be either a pro or a con depending on personal preferences. A Ford Explorer Sport is quieter. 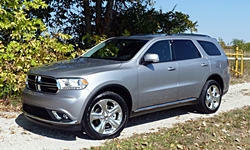 Overall, I've always found the third-generation Durango an attractive, clean-lined, well-proportioned vehicle. That said, even back in 2011 it had the curves of the earlier, "bar of soap" era. Seven years later, the Dodge's nearly edgeless shape can appear even more dated. Then again, some people might prefer it to the current fashion. SRT made minimal tweaks. Only those with sharp eyes will know from the fender badges and Brembos that they're looking at a 475-horsepower three-row track monster. Inside the story is much the same: attractive but somewhat dated styling. Materials are good for the price of the regular Durango but marginal for the price of the SRT. The standard black leather seats include synthetic suede center panels. For soft "Laguna leather" in medium red on the full seating surfaces, as in the tested vehicle, add $1,595. An optional $1,500 Interior Appearance Group, which adds carbon fiber trim and covers the instrument panel in stitched leatherette and the headliner in synthetic suede, renders the interior more worthy of the SRT's price. Just don't expect the ambiance to rival that in a much pricier Mercedes or Range Rover. The Dodge Durango's exterior dimensions and rugged, Jeep-level construction translate to a relatively long but also relatively narrow load floor well above the ground. Maximum cargo volume is slightly more than in a Ford Explorer, but significantly less than in GM's three-row crossovers, large conventional SUVs, or minivans. The Mercedes GLS can also carrry more stuff. Lower trim levels have a front passenger seat that folds forward for extremely long cargo, but the SRT lacks this feature. Dodge Durangos list for as little as $31,090. The SRT starts at a bit over double that amount, $64,090. Quite a spread for a single model. But wait, you can add more. The tested Durango SRT with nearly all options (but without the $595 track-grade tires) listed for $74,955. Too much for a Dodge that starts in the low 30s? A Ford Explorer Sport starts much lower, at $46,945. Even if you adjust for feature differences the Ford lists for about $16,000 less. But the 365-horsepower Explorer Sport much more directly competes with the 360-horsepower Dodge Durango R/T, which is priced at almost exactly the same level. Both take an extra second or so to get to 60 mph compared to the Durango SRT. Neither is suitable for track use. So the real question is whether the SRT upgrades over the R/T--115 additional horsepower, performance-oriented AWD system, limited-slip rear differential, Brembo brakes, adaptive dampers, wider tires, sport seats--are worth $16,000 to you. If you do want the SRT's performance potential in a gasoline-powered three-row SUV, the only viable alternative is the Mercedes-AMG GLS63, which starts at $126,295. With 577 horsepower, the Mercedes is even more powerful, but it's also another $50,000 even after loading up the Dodge to approach the GLS63's level of standard equipment. A Range Rover Sport Supercharged is priced closer to the Durango SRT--about $21,000 more before adjusting for feature differences, about $17,000 more afterwards. But its third-row seat is very cramped and not available on the more track-oriented, $111,000 Range Rover Sport SVR. Six years after the SRT engine was first offered in the related Grand Cherokee you can get it here. Folding both rows creates a long but relatively narrow cargo floor. 4x8 plywood won't fit flat. Dodge provided a insured vehicle with a tank of gas for a week. Ford provided vehicles and a meal at an event for invited media. 2018 Dodge Durango pros and cons, according to Michael Karesh: the best reasons for buying (or not buying) the 2018 Dodge Durango. Join TrueDelta to post your own impressions. Well written review. Looking at either a Durango or a Grand Cherokee next vehicle.I have driven mini vans for the last 31 plus years and am not interested in a sedan or full sized pickup. If I was a younger man with plenty of disposable income this Durango would be my choice. We can always dream.